I haven’t been able to put my alcohol inks down recently but I wanted to try something a little differently for this card. I’ve been focusing on super vibrant designs and today I wanted to tone it down a bit! I used LOTS of alcohol blending solution, just a little bit of pink sherbet and shell pink alcohol ink, silver mixative, and silver foil! 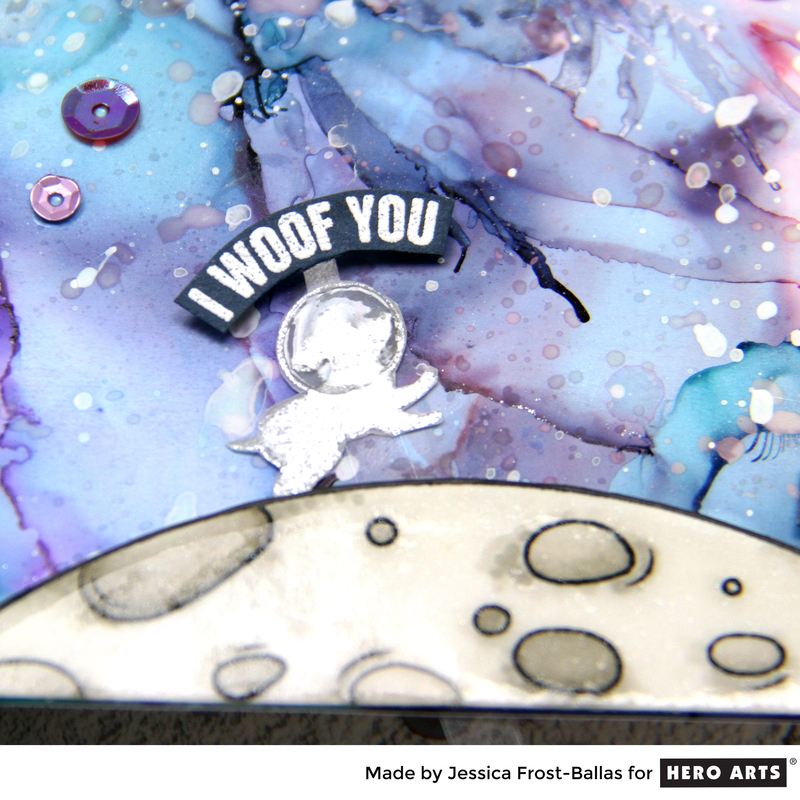 You can see a video on how I add foil to alcohol inked backgrounds here! Once the background was finished I set it aside to dry while I worked on the floral elements! 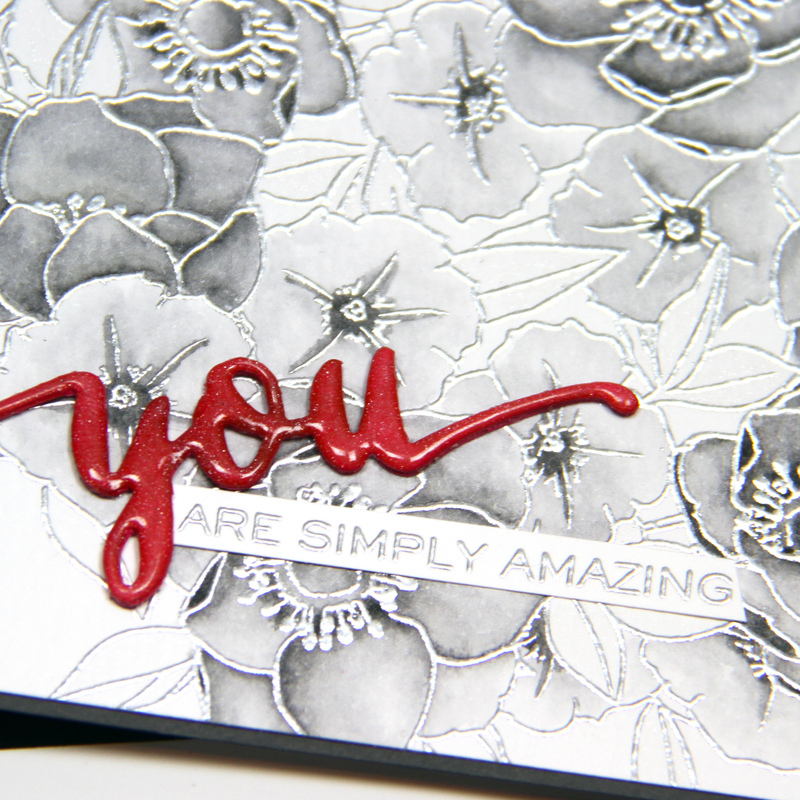 I stamped the sentiment from a different Altenew set, Peony Spray, onto grey cardstock and heat-embossed it with silver embossing powder. I trimmed that down to a flag and adhered it to the yupo panel. Finally I attached the flowers using a mix of regular adhesive and foam mounting tape! The Altenew Build-A-Flower: Peony Blossom set includes 1 stamp set (15 images) and 1 coordinating die set (8 dies). The Peony Blossom Build-A-Flower has a slightly different approach than their conventional Build-A-Flower sets. The stamp set has three five-petal flowers accompanied by a shading layer and a center layer. You may use these flowers as is, or layer them to create dimension. The matching dies will cut the flowers all the way to the edge without leaving a border. This will help in shaping the petals to the desired dimension when using a shaping tool (don’t have a shaping tool? You can use the domed end of a pen or pencil [or warped yupo, ha!]!). They also included an additional flower die and stamen dies to help you create realistic blooms! They named the set ‘Peony Blossom’ since the petals were loosely based on Peony petals, but you can let your imagination run wild and create different types of flowers! The Altenew Build-A-Flower: Peony Blossom is only sold as a set, not individually. There’s also an available ink bundle set! Altenew is generously giving away a $20 gift certificate to one lucky person who leaves a comment on my blog! 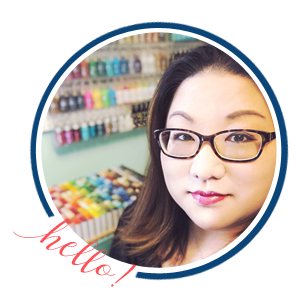 You can also leave comments on the Card Blog and Scrapbook Blog for more chances to win one of four $30 gift certificate! Leave your comments here by 11:59 PM EST on February 16th and the winner will be announced on February 17th! Good luck!! This is absolutely gorgeous. Love the colours, love the design. Stunning! Soooo pretty. You can’t go wrong with Peonies – or those gorgeous colors! WOW Jessica, this is really beautiful. I haven’t tried Yupo paper yet, heavy weight or otherwise so your tips on it are good to know for when I do. It certainly DID work to your advantage today. Just lovely! 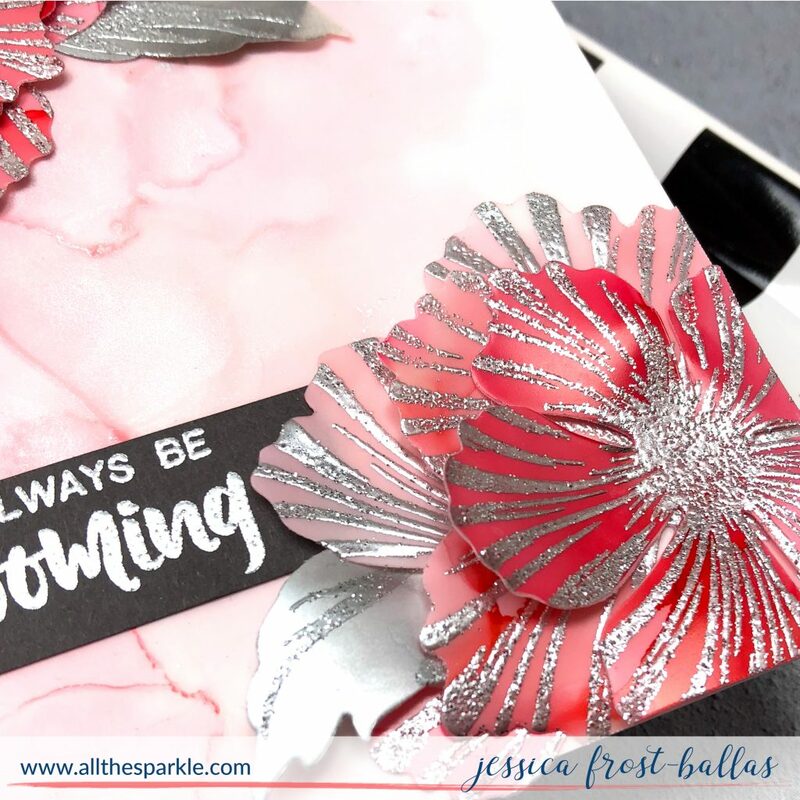 Gorgeous card, Jessica! I love the silver! Gorgeous with the silver and the shades of pink. Jessica, your card is stunning! Love your choice of colors and layout! 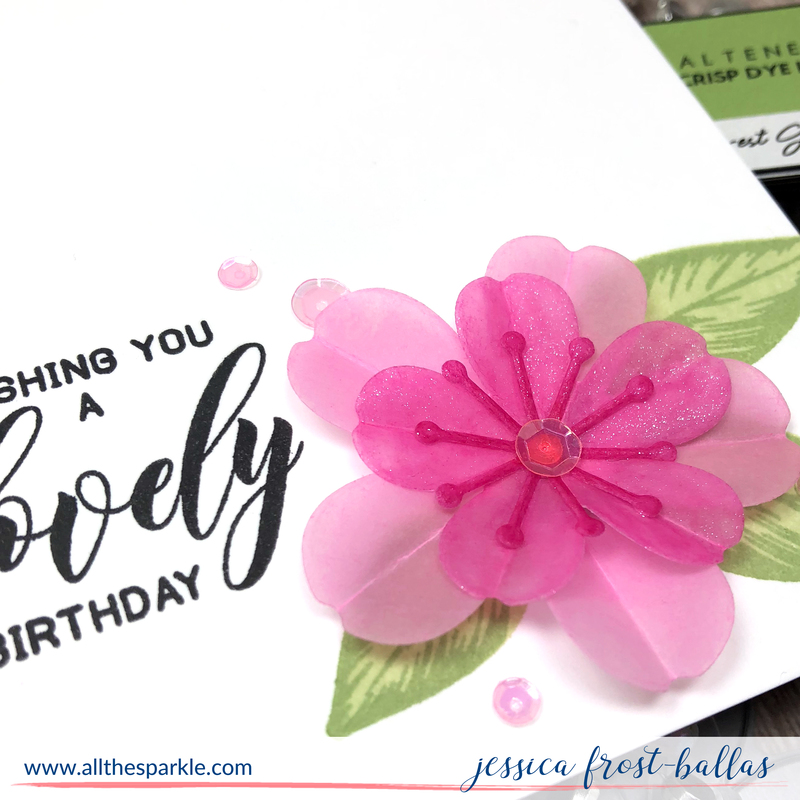 Beautiful card, Jess! I love the colors & that gorgeous silver! This is a lovely set & so nice that the dies cut right to the edge. Altenew is tops at florals! Just gorgeous! I love happy accidents, opens up new possibilities. 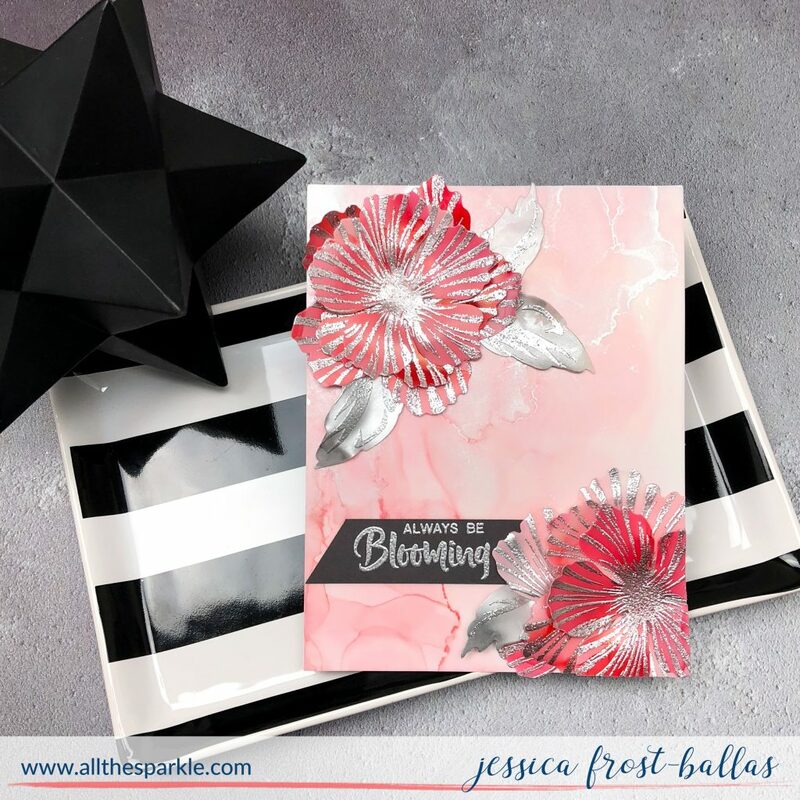 I love this pink marbled effect and I am putting that on my list to try today! Love this Jessica! Beautiful! Brilliant to use the heat tool to warp your die cut flowers. Such a cool set. WOW! This IS So COOL!!!! Love the colors you used! Adding the Silver gives it Shine and Elegance! Beautifully done! Great Creative, Colorful, Unique Work of Art! Great Job! Well Done Jessica! Wow, so stunning and elegant! Love the metallic silver accents. Hi Jessica I love your alcohol ink technique. Thank you for sharing this truly awesome technique accidental or not! Love everything about this card, awesome flowers! 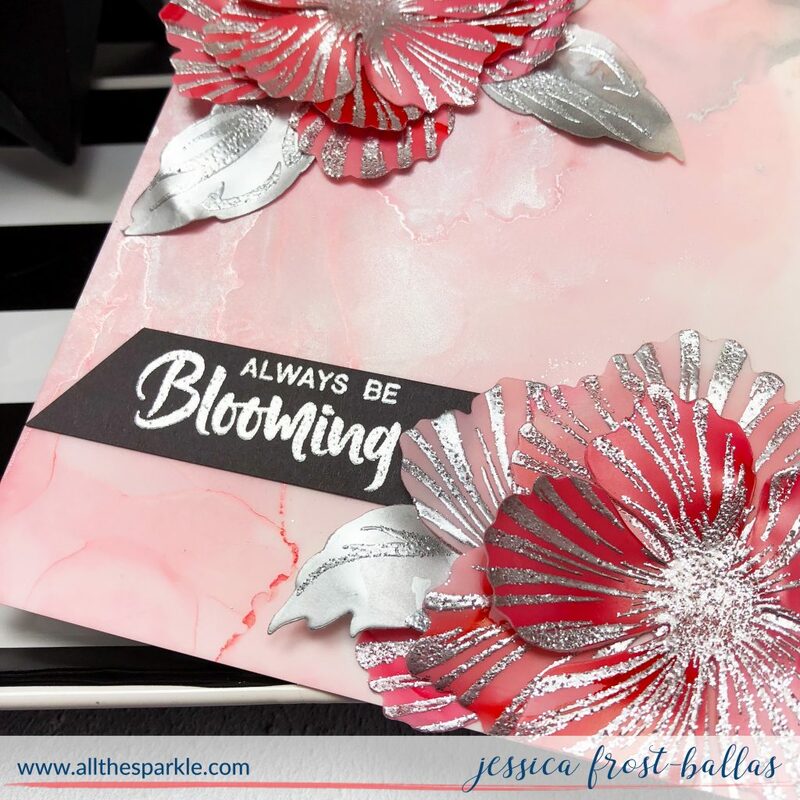 Oh Jess this foiled flower is fabulous, such shine in flower and leaf, the silver combined with the red looks fab, try some more colour combo’s and let us see what else you make like the alcohol ink video’s, really enjoyed this one. Stunning, you really made this new set shine!! So pretty – love the silver embossing. This is so pretty!! I love how you’ve made the flowers. Silver on red looks stunning. Love your wonderful card. The silver is beautiful. Peonies are my faves! This is gorgeous!